Ben & Jerry's, the ice cream brand owned by Unilever, rebuilt an "unbreakable" rainbow in Warsaw for LGBT rights. 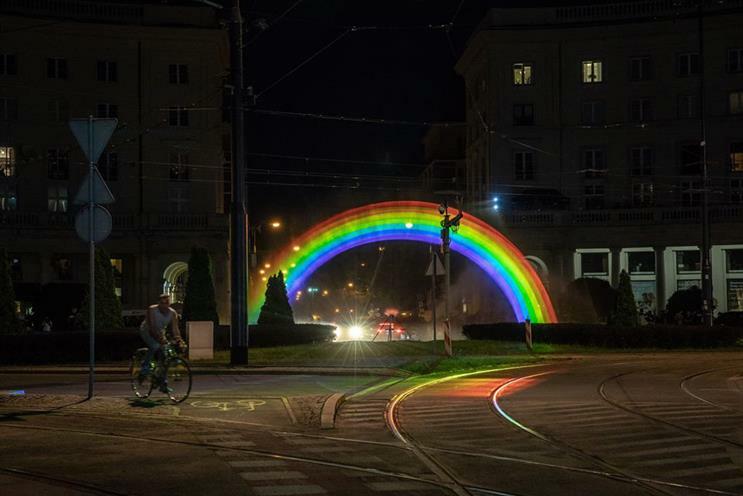 The rainbow, a water-light hologram, was the same size of the original 2012 floral installation which was torn down seven times by nationalists and opponents of LGBT rights, and so removed in 2015. "Rainbow’s return" was created by 180heartbeats & Jung v Matt. It was installed in Zbawiciela Square on 8 June, ahead of the Pride celebrations. Martyna Kaczmarek, brand manager at Ben & Jerry’s Poland, said: "We believe that everyone should be able to love who they love, which is why we’re partnering with Milosc Nie Wyklucza and Fundacja Wolontariat Równosci to champion marriage equality. "Through this rainbow display of light, love and strength we’d like to show the LGBT community that their love is unbreakable and equal. We’ve stood for a fair number of issues over the years, and this commitment to equality is grounded in our company’s unshakable belief that everyone deserves full and equal civil rights."